Colorful, lively, and festive. Extravagant yet elegant. A compilation of centuries old rituals and traditions set against a modern backdrop of thoughtfully designed place settings and memorable favors. Intricate details come together in a lush, breathtaking picture. If you have ever attended an Indian wedding, you have likely walked away reeling from the experience. More than just a ceremony bringing two people together for one of life’s ultimate journeys, the celebrations surrounding Indian weddings accurately portray the importance and sanctity of marriage. For Hindus, marriage is one of 16 samskaras, or rites of passages, experienced during the course of one’s life. With parents not only eagerly waiting for the day their child gets married, but also saving money for the big day, it is not hard to understand just why the is surrounded by such grand celebrations. A recent Pew Research Center study based on 2010 United States Census data confirms that Indian Americans place great value on marriage, parenting, and families. Over 64% of Indian Americans, compared to 34% of the general public, believe that having a successful marriage is one of the most important things in life. A successful marriage begins with a joyous celebration, one where no expense is spared and unique experiences are embraced. As the Pew Research Center study indicates, Indians equally emphasize the importance of education and hard work, both of which contribute to their ability to earn a median household income of $88,000 (as compared to the general pubic which earns $49,800). Strong purchasing power makes Indian Americans less likely to be concerned about finding ways to cut costs, especially when a wedding is involved. With a rather generous budget and multiple events over the course of three to four days, couples do not shy away from extravagance or creating their own trends. These multi-day affairs are typically attended by both close family and distant acquaintances alike. With a guest list that averages 300 or more guests, couples and their families seek venues not only with visual appeal, but also one that can comfortably accommodate a large crowd for multiple events. Many family members and friends travel from all over the country and the world to be a part of the celebrations, so choosing appropriate lodging arrangements is just as important. 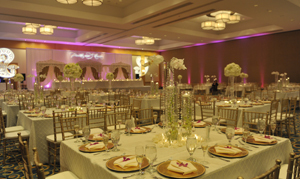 The three-day celebration typically culminates in a lavish reception that not only honors the newly married couple, but also gives family a chance to relax and dance the stress of wedding planning away! 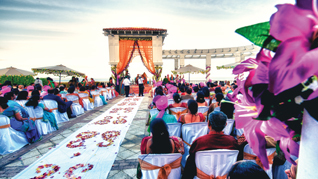 Recognizing it as the fastest growing wedding market, many businesses are now customizing services to meet the culture-specific needs of Indian weddings. With an average budget of $75,000 to $100,000 (an average American wedding costs $25,000), vendors truly cannot afford to ignore the potential windfall this market offers. From understanding dietary restrictions when developing menus to creating multi-day packages, hotels, banquet halls, and other wedding industry vendors are now rethinking the way services are presented and offered. More than just glitz and glamour, the extravagance of Indian weddings is an extension of the value that the Indian community places on marriage and commitment. 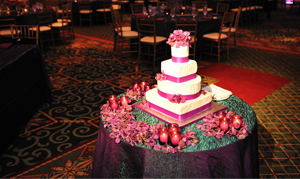 For couples, their weddings reflect individual style and desire to share their love for one another to the world. For vendors, Indian weddings offer a lucrative opportunity while being a part of a sacred ritual. Rina is the CEO and founder of The Arpan Group, a solutions firm that specializes in developing public relations campaigns to capture untouched ethnic markets. From press releases and media kits to marketing materials and by-line articles, The Arpan Group customizes solutions based specifically on the client’s needs. For more information about how The Arpan Group can assist your company or organization, visit www.thearpangroup.com or call (703) 651-6670.